Photonstophotos has published its dynamic range test results for the new Canon EOS R and Nikon Z7 full-frame mirrorless cameras. The numbers show that both Canon and Nikon trail the performance of Sony’s cameras. At ISO 100, the Sony a7R III has a Photographic Dynamic Range (PDR) of 11.64, the Nikon Z7 is 10.98, and the Canon EOS R is in last with 10.6. The Nikon Z7 does have a lower native minimum ISO of 64, but even there it has a PDR of 11.56, which still trails the Sony score at ISO 100. At base ISO, Canon’s EOS R (10.6) is closer in dynamic range performance to the APS-C Sony a6500 (10.31) than to the full-frame Sony a7R III (11.64). At ISO 25600 (the max native ISO of the Z7 — the Sony goes to ISO 32000 and Canon has ISO 40000), Sony scores 4.34, Nikon is measured at 4.25, and Canon is 3.85. What’s interesting about these test results is that Sony is the world’s leading image sensor manufacturer right now in quantity (and arguably quality), Nikon uses Nikon-designed/Sony-manufactured sensors in pro-grade cameras such as the D850 (and perhaps the Z7? ), and Canon makes its own sensors and only recently began selling them to third parties. “[K]eep in mind the Canon and Nikon cameras are the newest cameras meaning that the gap is expected to increase once Sony announces the new models,” sonyalpharumors writes. Despite the apparent differences in scores, however, this test also shows that all three cameras have very similar dynamic range performance that’s in line of what’s expected of top full-frame cameras — the numbers above are all better than or equal to pretty much all cameras on the market, so don’t read too deeply into them. Holga’s recently-announced Holga Printer will let you turn smartphone photos into Instax prints without needing a battery, but that printer will cost at least $48 and won’t arrive until after March 2019. KiiPix is a $40 analog printer that’s essentially the same, and it’s already available. The designs of the two printers are strangely similar — it’s unclear whether the Holga Printer is simply a rebranded version of the KiiPix product. Using KiiPix is also super simple: open the printer up, make sure there’s film inside, place your phone on the holder, and print by pressing the lever on the side. Once your print has been exposed, a hand-cranked knob on the side of the printer is used to manually eject the print. These printers are essentially compact pinhole cameras that allow you to expose your smartphone display onto Instax film. Turning your brightness all the way up ensures that enough light is collected while the print is being made. A mirror on the surface of the printer lets you align your phone screen while it’s pointed down. The KiiPix can fold up compactly when not in use. And since it doesn’t require any kind of battery or cable, it’s a pocket printer that can be taken everywhere. KiiPix is a product of the Japanese company Tomy. After launching in July 2018, it quickly became a top 10 product in Amazon’s portable printer category. KiiPix is available in Cherry Blossom, Sky Blue, and Jet Black and can be purchased for $40 from Amazon. Sony has announced the new Cyber-shot HX99, what the company calls “the world’s smallest travel high zoom camera.” The camera features a powerful 28x zoom and 4K video recording. At the core of the camera is an 18.2-megapixel backside-illuminated 1/2.3-inch Exmore R CMOS sensor with an ISO range of 80-12800 and 10fps continuous shooting. On the front of the camera is a 24-720mm (35mm equiv.) zoom lens with 28x optical zoom. Clear Image Zoom provides digital zoom up to 1440mm. The features of the camera are unusual considering its size: measuring just 4×2.3×1.4 inches (10.2×5.81×3.55cm) and weighing just 8.54oz (242g), the HX99 is “the world’s smallest camera body of its kind,” Sony says. By kind, Sony means fixed-lens cameras with a built-in viewfinder and a maximum telephoto focal length greater than 700mm (35mm equivalent). The top and back of the camera have a retractable OLED Tru-Finder electronic viewfinder and a 180-degree tiltable LCD screen. For video recording, the HX99 can shoot 4K with full pixel readout and no pixel binning. Drop down to HD resolution can you can shoot up to 120fps for slow-motion sequences. Other features and specs of the HX99 include Optical SteadyShot image stabilization, Zoom Assist (a temporary zoom-out display to show a wider area when shooting far subjects), 0.09 autofocus, Eye AF, RAW photos, Touch Focus, Touch Shutter, Touch Pad, a customizable Control Ring, and Bluetooth connectivity. The Sony Cyber-shot HX99 will be available in early November 2018 with a price tag of $450. As a filmmaker, I come across many different types of cameras, lenses, and of course all the peripherals that come with movie making. For commercial shoots I am currently shooting on a Canon C200 cinema camera using the Canon RAW lite codec. The results are incredible. A few weeks ago I picked up the new iPhone XS max and as a photographer and film maker the first thing I did was open up the camera app to see how it looked. To be honest, I was actually shocked. It looked awesome. Over the next few days I took a few videos and found myself actually watching them back on the phone and being pretty impressed. I would then watch a video I shot on the C200 and to be honest I would question which one I liked more. So that was it, I just had to test them out. It was pretty simple. I stripped back the C200 to the body the Sigma 18-35mm f/1.8 Art as this gave me a pretty similar focal length to the wide lens on the iPhone. I attached the iPhone XS to the top of the C200 and placed them both on the DJI Ronin-S (I cant believe I actually got this balanced). I used the regular Apple camera app and spend an hour shooting to see what I could come up with. Back at may studio (In Color Studios), I put the footage together and threw on a color grade. The iPhone footage took almost no work to color grade whereas the C200 to a lot of heavy lifting which is one of the joys of shooting in RAW. When viewed the footage on a small iPhone scene they both looked fantastic. I was impressed to say the least but it all fell apart when viewing in fullscreen on my 27-inch iMac. Too much sharpening meant the details just got lost and all the leaves with details just got smushed together. The C200 still looked great. You can see the results for yourself in the video. The dynamic range of the iPhone XS is super impressive. It’s able to keep the highlights on the bright sun while keeping details in the shadows. This is some crazy multiple exposure processing that’s been done. Considering this is all being done in real time in the palm of your hand, it’s super impressive. In conclusion, the iPhone camera is a smartphone camera and always will be. It is incredibly small but gives completely mind-blowing results. If you are shooting to video that is intended to be viewed on a smartphone and you don’t want to do any post processing then the files strait from the app are impressive. Apple has done a great job of optimizing the output to make the files look great instantly. Does it come close to a cinema camera? Not at all. Is it as good as a cinema camera, not at all. Is it the best camera I have ever seen on a smartphone? 100%. About the author: Ed Gregory is a photographer and the founder of Photos in Color. The opinions expressed in this article are solely those of the author. Gregory teaches tutorials on Photoshop, Lightroom, and photography, and you can find more of his videos on his YouTube channel. This article was also published here. Google has unveiled the new Pixel 3 and Pixel 3XL smartphones. The new generation of Pixel phones features an improved camera that’s backed by Google’s AI. The Pixel 3 features a 5.5-inch screen and the 3XL has a 6.3-inch screen. On the back of the phones is a 12.2MP 28mm f/1.8 (35mm equiv.) dual-pixel camera. A new feature called Top Shot uses AI to capture alternate shots in HDR+ and then recommend the best one from the sequence, which you can flip through and select a photo from yourself. The zoom is now aided by a Super Res Zoom feature, which uses computation photography from the world of astronomy and scientific imaging to provide sharper details when you’re zooming. When shooting in low-light environments, an upcoming feature called Night Sight will help you shoot natural-looking photos without the aid of a flash. The feature combines multiple exposures to create low-light photos with less noise and more detail. The fronts of the phones now have two separate cameras: an 8MP 28mm f/1.8 (35mm equiv.) standard one and an 8MP 19mm f/2.2 (35mm equiv.) wide-angle one. For selfies, a feature called Group Selfie provides 184% more room in the photo while shooting with the wide-angle camera. Like the new iPhone XS and XS Max, the new Google Pixel 3 and Pixel 3XL allow you to adjust the blurriness of the background after shooting Portrait Mode photos. In addition to tweaking the depth of field, you can even select a different focus point after the photo is captured. All photos and videos are given unlimited Google Photos cloud storage at their original resolutions. Non-photo features and specs of the phones include Google Lens, Smart Composite in Gmail, Google Assistant (the AI can now handle real-world tasks like calling restaurants to book a table), AI call screening, wireless charging, IP68 water- and dust-resistance, Android 9 Pie, a secure custom-designed Titan M chip, Qualcomm Snapdragon 845, 4GB RAM, and a 2915 mAh battery. 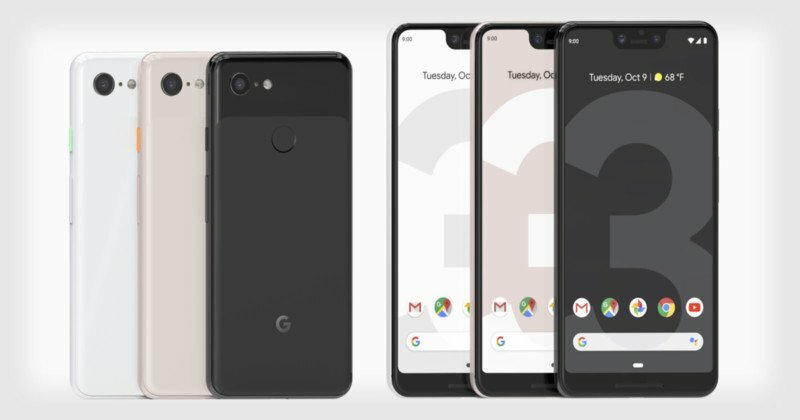 The Google Pixel 3 and Pixel 3XL are available for pre-order now from Verizon, Project Fi, and the Google Store unlocked. Colors are Clearly White, Just Black, and Not Pink. Microsoft has paused the rollout of its latest Windows 10 update after users reported that photos and other personal files had been wiped without warning by the latest version of the operating system. The Windows 10 October 2018 Update (version 1809) was made available on October 2nd but hadn’t yet been pushed through Windows’ automatic update system. Some people who chose to install it through Windows Update soon reported that their personal documents folders had been wiped clean. Photos, videos, music, documents, and other files were nowhere to be found. Microsoft responded on October 4th by pulling the update for further investigation into the bug. “We have paused the rollout of the Windows 10 October 2018 Update (version 1809) for all users as we investigate isolated reports of users missing some files after updating,” Microsoft writes. If you installed the update and were stunned to find your photos wiped, Microsoft says you should “minimize your use of the affected device” and immediately call the company for help directly at 1-800-MICROSOFT. Microsoft support technicians “have the tools to get you back to a good state,” Windows Insider Program lead Dona Sarkar tweets. Based on that statement, it appears that the deleted files may be recoverable, but it’s definitely a good idea to refrain from using the computer further to ensure that things don’t get overwritten and lost forever.